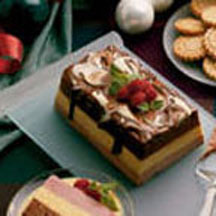 An impressive and elegant dessert that, when served, is sure to be the crowning moment of a Christmas meal. Beat egg yolks and sugar until thick. Set aside. Melt chocolate with 2 tablespoons cream in a heavy saucepan over low heat. Stir until smooth. Quickly whisk in egg yolk mixture and butter. Remove from heat; stir in vanilla and chill until thick but not solid. Eggnog Mousse: In a small bowl, sprinkle gelatin over 3 tablespoons cream. Set bowl in a pan of hot, simmering water, stir to dissolve. In a double boiler, melt white chocolate; stirring until smooth. Using a wire whisk, add gelatin mixture, egg yolks, eggnog and nutmeg to melted chocolate. Cool until very thick, about 20 minutes; stirring occasionally. Raspberry Mousse Layer: In a saucepan, heat but do not boil raspberries. Cool and force through sieve with back of spoon to remove seeds. Set raspberry purée' aside. In a small bowl, sprinkle gelatin over 3 tablespoons cream. Set bowl in a pan of hot, simmering water, stir to dissolve. In a double boiler, melt white chocolate; stirring until smooth. Using a wire whisk, add gelatin, egg yolks, and raspberry purée to melted chocolate. Cool until very thick, about 20 minutes; stirring occasionally. Whip remaining cream to peaks. Fold 1/3 whipped cream into raspberry mixture. Gently fold in remaining whipped cream. Do not over-mix. Spread over eggnog mousse layer. Cover with plastic wrap and refrigerate at least 8 to 12 hours. Eggnog Sauce: In a saucepan, heat eggnog and nutmeg to simmering point. Beat egg yolks and sugar until thick. Add 1 cup hot eggnog to egg yolk mixture, beating constantly. Return to saucepan, cook and stir until slightly thickened. Remove from heat and stir in vanilla. Allow to cool. Refrigerate, covered up to 2 days.